Doctoral candidate Evan Fein recent caught up with alum Eric Whitacre for this special technology issue of the The Journal. 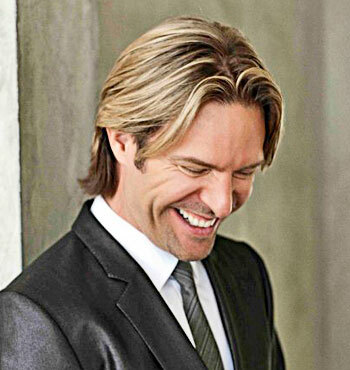 Composer and conductor Eric Whitacre (M.M. ’97, composition) is undoubtedly one of the most successful and prominent figures in classical music today. Known first and foremost for his contributions to choral music, the 43-year-old musician has also created significant works for wind ensemble, orchestra, and more recently for the musical theater stage. His wildly successful and varied career has led him to work with artists and ensembles ranging from the London Symphony Orchestra and the Tallis Scholars to Hans Zimmer and Annie Lennox. His groundbreaking project Virtual Choir—in which performances of a given song by singers around the globe are digitally compiled into an otherwise impossible “super choir”—has more than six million views on YouTube. And the Eric Whitacre Singers won a best choral performance Grammy in 2012 for its debut album. A noted public speaker, Whitacre has shared his ideas with global leaders and innovators through TED talks and an appearance at the World Economic Forum in Davos, Switzerland. Yet less than two decades ago, Whitacre would doubtless have been the last person to expect such an array of honors. Having grown up in a small town in rural Nevada and taken a healthy seven years to complete his bachelor’s degree at the University of Nevada, Las Vegas, Whitacre had hardly had an auspicious or prodigious start to his musical life when he arrived at Juilliard at the age of 25. Antics aside, however, Juilliard was truly a time of soul-searching for Whitacre. While his pre-existing choral works were off having lives of their own, Whitacre found little institutional support of his music, and certainly didn’t win any of the various prizes the composition department grants annually. His first teacher here was David Diamond, who said of his early work for band Ghost Train (still widely performed today), “Well, it’s effective, but I certainly wouldn’t call it music.” It wasn’t until his second year, when he transferred to John Corigliano’s studio, that he found a strong and encouraging mentor. “He just wanted to talk about the creative process in the abstract, and nobody had ever done that for me,” Whitacre said, noting “the idea of building a piece, its dramatic structure, before you ever write a note is incredibly liberating.” He still creates precompositional graphs of his works, as Corigliano has his students do, and refers to them throughout the compositional process.